Set me on a silver sun, for I know that I'm free. Long jet-black hair, almond eyes, delicate features, and perfect caramel skin contrasting with the white sheets on the bed. That sight makes it easy to open one’s eyes in the morning. Song stirs and sees that I’m awake. A moment later she hops out of bed with a “me shower first.” As I reach for the remote, I laugh to myself as I wonder if she is an early riser or she got enough last night. It’s nice to see Song come out of the bathroom wearing the robe again instead of that damn towel. As I head for the shower I think about supplying my own robes if the hotel doesn’t. One can always purchase a pair from street vendors. I figure it would be worth it. After the trip, I can always give silk robes away as presents. Ah, yes. 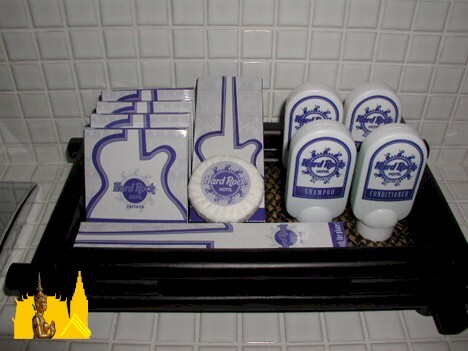 Stepping into the shower I see again that Song does enjoy the potions and goops supplied by the hotel. As long as she puts the cap back on my toothpaste, I’m happy. Stepping out of the shower, I hear Song singing in the other room. I really like that. I notice each day, Song is eating a little more for breakfast. Is that because she’s feeling more comfortable at the hotel, or maybe she’s not eating enough during the rest of the day? Beats me. As we’re finishing breakfast, I suggest we brush our teeth and then I’ll ask the hotel’s travel desk about hiring a car for the day. We round the corner to the elevator lobby, and return the morning salute from the elevator guard. The doors open to our floor and we say “hello” again to George, Paul, Ringo, and John. S ong thinks it’s funny we talk to the painting every time we pass it. If I forget to say hello, Song will stop me and point to the mural. She is even starting to learn the names! I was surprised. OK, the teeth are all brushed (even the ones in the back) and we’re collecting what we need to start our day. That’s when Song tells me she has a friend with a taxi. At first I’m a little skeptical but if it is cheaper than the hotel, why not. I hand the phone to Song, and she calls. Song has a short conversation and gives me the handset, motioning me to talk. There’s a woman on the other end of the line, and she speaks English surprisingly well. She tells me that her father has a taxi and will take me to the Sri Racha Tiger Zoo and to a little island for 1000 baht. As I’m trying to remember what the other daily car hire prices I’ve seen were, she throws in that the price includes lunch for everyone. I covered the mouthpiece and asked Song if the girl was her friend; she was. So I agree. Hah says the taxi will be here in 10 minutes. That will give Song and I just enough time to get to the Beach Road gate. Song and I step through the Beach Road gate, and I stop as I look for a taxi. Song stops for a heartbeat and then grabs my hand dragging me to a car. I was expecting to see a taxi; this looks more like a family car. Song introduces me to her friend, Hah; and Hah’s father who will be our driver for the day. Hah seems like another sweet girl, and I have a feeling today will be a good day. When we climb into the car I leave a little space between Song and myself, because Hah is Song’s friend and Hah’s father is in the car… Anyway, I just though it was the respectable thing to do. That little space didn’t last long as Song slid over to sit next to me. I try to learn a few new words every day. Most of the girls I meet are happy to teach me. I think they appreciate it when we try to learn their language. Yesterday one of the words I learned was the Thai word for ‘hungry.’ Last night as we were sitting in Song’s bar, I tried to ask Song if she was hungry, but I couldn’t remember the right words. Song sensed I was struggling and encouraged me to speak. Instead of ‘hue mak mak’ I said ‘hoy mak mak.’ That’s not too different, is it? At first Song had a shocked look on her face. A moment later she began to laugh and tell all her friends. A s it turns out, I said something like, “Look at all the p*ussy!” Sheesh… It’s nice that I could entertain Song and her coworkers. Well, Song decided to dust off the story again and told it to Hah and her father. Upon hearing the punch line, they all broke into laughter. Hah’s father really liked the story; if the girls were quiet for more than a few moments, he would say, “Hoy mak mak” and everyone would be laughing again. Hah reached into her purse and passed out a little traveling snack of preserved salted plums. Everyone was surprised I had a package of preserved mandarin peels in my camera bag -- straight from China via San Francisco. The ride to the zoo was so enjoyable; I can’t really say how long it lasted. Sitting in the back seat, I felt satisfied I had found some good people. Or more correctly, they had found me. I guess the good living paid off. Hah’s father found a tree to park under, and we all got out of the car. 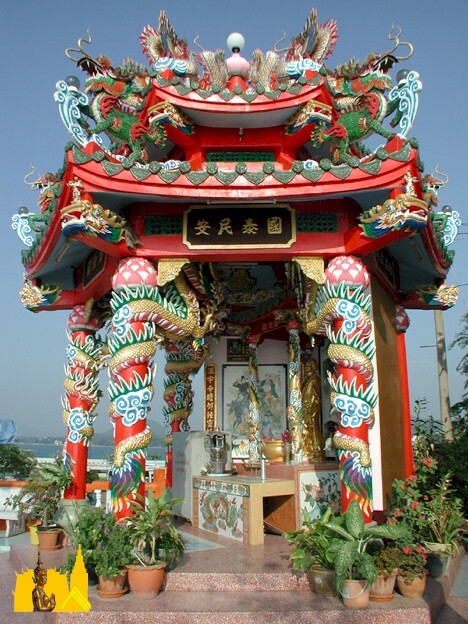 In front of the ticket kiosk is a large shrine. My hosts angled off to pay their respects before heading towards the ticket booth. Hah’s father wanted to stay at the shrine and said he would stay there waiting for us to return. Although I cannot read Thai, it was pretty easy to see that there was a ticket price for farangs and a different price for Thais. Song encouraged me to buy the tickets, but I handed the money to Hah saying I can’t speak Thai. Of course, Hah got the Thai price. As I recall, the farang price was 250 baht, and the Thai price was 100 baht. The Sri Racha Tiger farm is like a Thai version of Marine World Africa USA. There are monkey shows, bear shows, elephant shows, and shows with tigers. There are swimming pigs, and racing pigs. One can even have a ride on an elephant! Entering the zoo, Hah went straight for the building that houses the baby tigers. It was interesting to see that they use sows (lactating pigs) to feed the baby tigers. On the other side of the room, you can hold a baby tiger. On our way to the Tiger Show we found a nice Koi pool. They had a vending machine selling food, so I got everyone a little something to feed the fish. It was nice to watch the girls having so much fun. 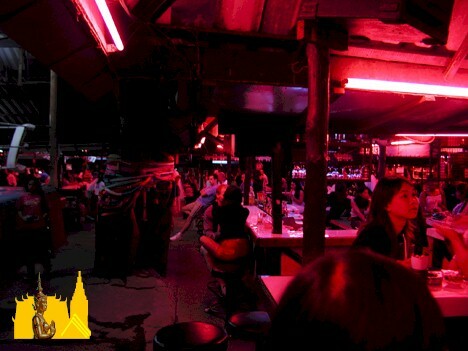 I thought there was something wrong with the tigers in the show – they moved slower than a katoey on Sukhumvit. I’ve send big cat shows before, but I’ve never seen them move so slowly or be so uninterested in their surroundings. It looked to me like they were drugged. That’s exactly what I thought until one cat walked a little too close to another, and the second cat decided to show the first exactly which cat owned the space. The tiger tamer wasted no time rushing in and showing everyone who really ran the show. After that I figured it all made sense; the Thais move slowly – the Thai tigers move slowly. It’s too hot to move any quicker. The monkey and bear show followed the tiger show. Song and Hah were delighted to see the monkeys, but I thought the Thai bear was more interesting. Walking around in the sun helped work up a powerful thirst. I asked the girls if they wanted anything, but they said no. As soon as they saw I was buying some water, they wanted ice cream. 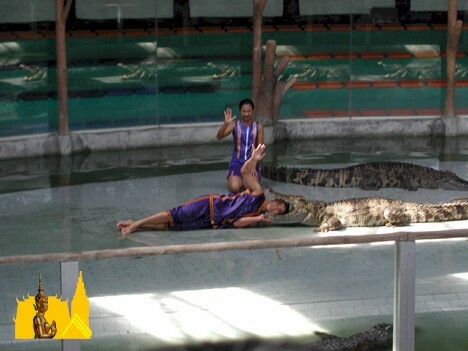 They also have a crocodile show at the zoo. We got there a little late, but to me it looked like they just pulled around the crocs by the tail, until the last trick. Yup, that guy stuck his head in the crocs open mouth. We walked around the zoo a little and Hah was very eager to practice her English and learn new words. Hah would often point at something and ask how to say it in English. The elephant show was pretty interesting. I’ve seen a few elephant shows before, but this one was pretty good. Some of the elephants were pretty big; much bigger than the elephants I saw on Phuket. Hah said the big elephants with the brandings were retired logging elephants from up north. Some of the elephants could walk on their front legs; some could walk on their hind legs. 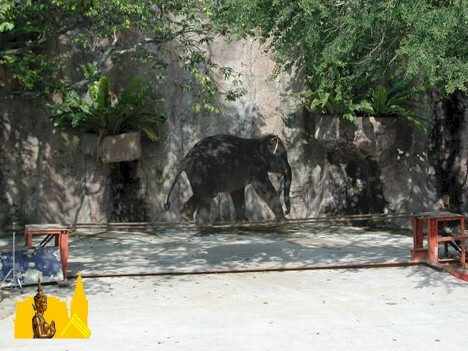 One elephant even walked on a tightrope! The Master of Ceremonies stopped the show to ask for two volunteers from the audience; one man and one woman. The MC had the man lay on his back; and the woman on her stomach. A large elephant walked over to the woman, raised a giant foot, and began to massage her rear end with his foot much to the delight of the audience. Not to be outdone, another elephant lumbered over to the man lying on his back and used its trunk to help the man relax in a completely different way. An elephant bl*w-j*b? The audience went wild with that one! 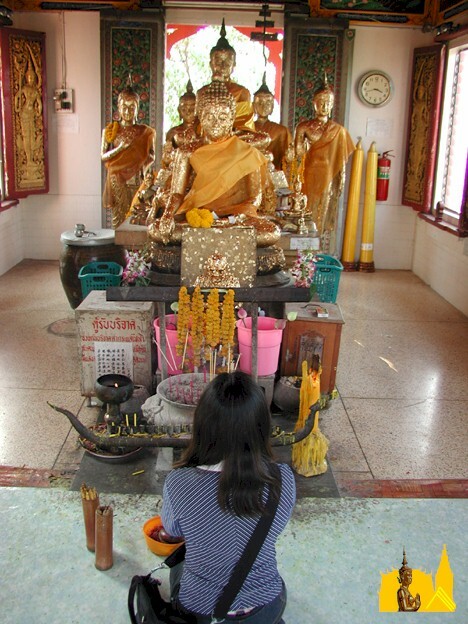 We exited the Tiger Zoo and found Hah’s father sitting behind the shrine with a bunch of other drivers. It looked to me like the drivers of the tour buses were enjoying a snort or two of Mekong. Not a comforting thought as I sometimes like to take bus tours. The drive through the city of Sri Racha was very nice. I enjoy seeing new places and watching people go through their daily lives. It’s also nice to see a little of the country away from the bar scene. The bar scene is OK at night, but I just can’t keep at it 24/7 anymore. A couple hundred yards off the coast of Sri Racha is the tiny island of Koh Loy Sri Racha. A bridge allows us to drive on to the island. While driving on the bridge, we noticed many fishing boats moored to the side. The island is relatively small; prolly less than 2 acres, and has a good-sized hill on it. There is a temple complex made up of a dozen or so temples that on the outside exhibit a more Chinese influence. We got to the island just behind a Japanese tour bus, so the steps to the top of the hill were a little crowed. A lot of the older Japanese couldn’t make it up the steps, and when we finally made it to the top, we were pretty much left alone. 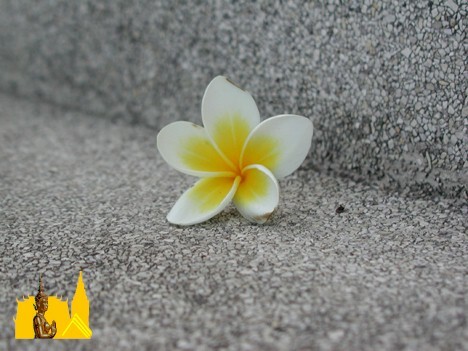 On the climb up to the top, I noticed a flower had fallen on the steps to one of the temples. Even though it was really only garbage, it struck me as one of the most beautiful flowers I had ever seen. I got out my camera, put it in the macro mode (first time for me), laid down across the steps, and tried to take a picture. As I was trying to take the picture, I could see out of the corner of my eye that the girls were getting impatient. “OK, OK we go now,” Song said. “No problem, I’ll see you at the top.” With that, they split. It only took a minute or two to get the picture and I was done. I carefully turned the camera off and put it in my camera bag. I got up, dusted myself off, and turned around to see a line of a dozen monks waiting for me to get out of the way. A little embarrassed, I hopped out of the way and gave them a small bow as they passed. I found the girls wandering around at the top. I asked Song if she wanted to make merit, and she eagerly nodded yes. I gave Song some baht and she came back with a merit kit (blossom, incense, candle, and rubbing gold) for each of us, and passed them out. I’ve done this a couple of times before so I’m starting to get the hang of it. But like I always do; I move slowly and keep one eye on my guide just to be sure. Of course there has to be a new wrinkle at the end of the ceremony; the shaker cup. After all of our offerings have been placed, we pick up a cup full of wooden sticks. After shaking the cup for a few moments, an amazing thing happens; one of the wooden sticks will work its way up and out of the cup. The girls pick up the stick, note the number, and run off to get the fortune for that number. Each fortune sheet had one’s fate translated into 4 or 5 languages. Song and Hah thought my fortune was a bad one. 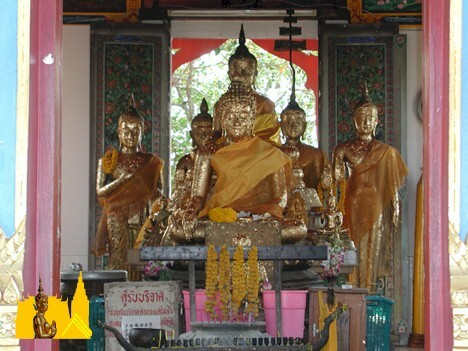 According to those two, if one receives a bad fortune they should leave it at the Buddha statue. 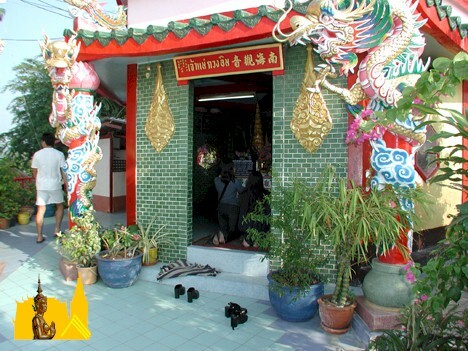 Besides the temple complex, the little island is also home to a sea turtle farm. There was a large pool with a number of sea turtles swimming around, but the water looked so foul I didn’t think the pictures would come out. Hah and Song said they were hungry. They led me over to some food stalls in the parking lot area; where Hah’s father is already chowing down. That was some of the best bar-b-que cuttle fish I've ever eaten is served. Actually, it was the first time I’ve ever eaten it, but it was damn good. We bought about 10 sticks of bar-b-qued cuttle fish, and a baggie of pepper sauce. Song said the sauce was too hot so I should not eat it. I wanted a little taste so I dipped the corner of a piece of cuttle into the sauce. It was pretty hot stuff. We leave Sri Racha by a different route from which we came. No problem, I figure they're taking the scenic route for my benefit. Hah's father drives on for 10 or 15 minutes and enters a giant shipping complex. 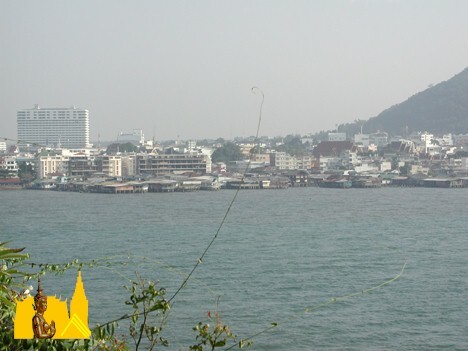 It reminds me of a Thai version of Long Beach Harbor. We drive on past stacks of shipping containers and towering cranes used to load the containers on and off the ships. Where the hell are we going? We pull up to a small group of buildings where Hah’s father parks the car. OK, this should be interesting... We all get out and proceed up a short flight of stairs. We are in the shipping complex's cafeteria and this is where we'll be eating lunch. It turns out that Hah leased the cafeteria about 3 weeks ago. Right now she is on probation from the shipping company and if the place continues to stay clean and the food stays tasty, she'll get a long-term contract. I told Hah the place is very clean so she will have good luck, and she is absolutely beaming as she gives me a little wai. It sounds like a risky bet for her, she had to pay 600,000 Baht key money, 100,000 Baht per month rent, and if there's a problem (like the food is not good, or the place is not kept clean) the shipping complex can kick her out at any time. She has a couple sisters working at the counter and her father acts as a manager. From what I saw it's a tight, fun ship. One of the sisters brings out some chicken and vegetables fried in a sauce, some cooked pork topped with cilantro, and another plate that they all say I cannot eat because it is pet mak mak. When Song isn't looking, Hah puts a little on my plate. Song catches her and starts to scold her. I say it’s okay; I wanted a taste anyway. When I use my fork to slide a small piece onto my spoon, they stopped talking to watch me. It’s hard to describe how it tasted; let’s just say it felt like a firecracker went off in my mouth. It is indeed pet. Way pet, in fact. Too fookin pet. Here I am watching these two little angels eat this food that must come from the deepest bowels of hell. I'm amazed they can eat it and laugh; one bite and I had to gulp down two bottles of water. Hah said she has to be at the restaurant every morning at 5AM to prepare for the 7 AM opening. S he leaves the restaurant and goes straight to the bar where she dances until 2 AM. In addition to those two jobs, Hah also sells real estate with her father. 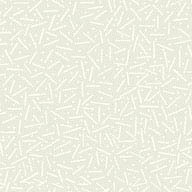 I made the mistake of asking about prices in the area and that put Hah into selling mode. I thought it might be a good idea to rent an apartment, but Hah insists it would be a better idea to buy a house in Song’s name. Hah and her father wanted to take me around to show available places. It was interesting to talk with Hah but I wouldn’t be ready to buy for another year, so I promised to come back next year and Hah could show me around. It was a nice drive back to the hotel, and Song and I were pooped. We headed up to the room (paying our honors to George, Paul, Ringo, and John) for an afternoon nap. Around 5 PM Song shook me awake and handed me the TV remote saying, “Up to you.” I handed it back to her and said, “No, up to you.” She grabbed the remote with a smile, and turned on a Thai soap opera. It looked like the one we watched the other day, with handsome princes, beautiful princesses, and kung fu fighting. In the middle of the soap opera, we saw a dwarf in a monkey suit! I pointed at it and said, “Monkey boy!” Song started laughing and said, “Ling toepoo!” I pulled at the hair on my arms saying, “Monkey boy, monkey boy, ling toepoo!” Song had a big laugh over that one. The lottery girl came over again, and I let Song do the honors. This time she pulled a VIP card. The VIP card entitles me to 10% off drinks, use of the short time room, and bar fines; presumably for the rest of my life, as there’s no expiration date on the card. We finished our drinks and headed out to find a restaurant. There was supposed to be a party at the Free Lancer Bar (3rd anniversary, I think) so I wanted to choose a restaurant on Walking Street. I found a place that had a bar downstairs with a restaurant upstairs. We were able to get a table that overlooked Walking Street and could people watch as we enjoyed our dinner. Song wanted to pick out the food so I’m not sure what we ate. But I think dinner included boiled pork soup, chicken with cashews, and white rice. There was a great live band that played in the bar downstairs. After dinner we walked down to the Free Lancer Bar, but it was pretty dead. Song wanted to watch some kickboxing, so we went back to the ring by the Doll House. A few beers and Spys later, Song said she knew where there was a better boxing ring. I put some baht in the cup, and Song led me down Beach Road. As it turns out, Song had some friends that worked at a beer bar next to the boxing ring on Beach Road. T hey were fun girls, and we all had drinks and made little bets on our favorite boxers. One of Song’s friends came over to me and asked if I would bar fine her. A different time, a different place, a different girl, and it could have been a wild night. But Song was laughing too much to be interested. The beer bars started to close, and that was our cue to call it a night. It was a full day. Remembering all we did while being held in Song’s arms was a good way to fade off to sleep.